← How to make biking for all, not just the rich or poor? 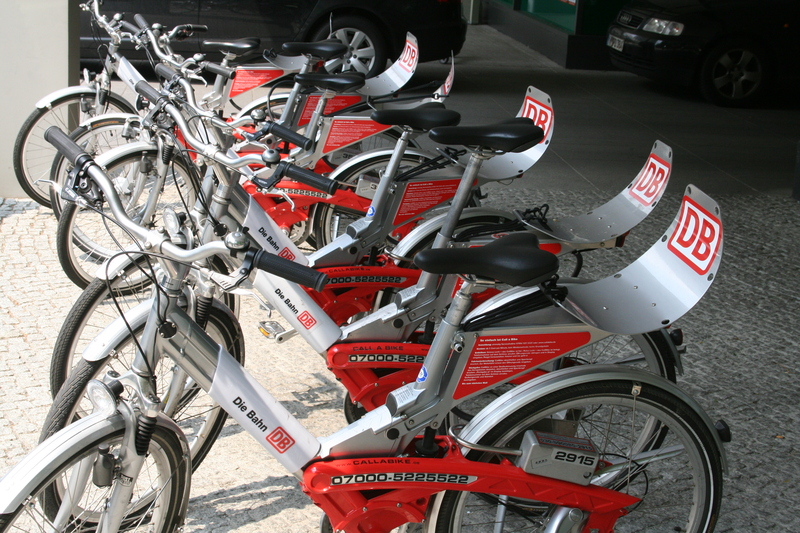 There are currently 238 bikeshare schemes in the world. This appears to be increasing at roughly 50% per year. 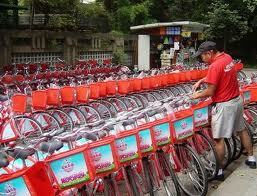 If this rate continues, we will have some 1.200 bikeshare schemes by 2014. The next areas of major growth is in the US, Canada, and Australia, all of which also have pitiful cycling rates of around 1% of people biking in most cities. It will be exciting to see how these cities adapt European models for their local context. But w hat about rapidly developing countries like India, China, and South Africa that have high cycling rates now but that are losting cyclists as the economy picks up and more people move to cars? They have many large contextual differences with Europe, but if they are to take any inspiration from bikesharin models, maybe they should consider looking at countries with robust cycling cultures like Holland, Denmark, and Germany- who are trying to keep people on bikes- not those with few cyclists like France, UK, or Spain who are trying to move people onto bikes. Early innovation in bikesharing came out of robust cycling cultures like Holland and Denmark where about 20-40% of the population bikes. Most of the early growth in recent, high-tech bikesharing has come out of countries like France, Spain, and the UK where only 1% of the population rides a bike for transport. Another big expanding market will be in rapidly developing countries like Brazil, China, South African and India which all have very high cycling rates which range from roughly 20-70% of the population. These are mainly ‘captive users’ who bike because they can’t afford other options. As people get richer, they move to motorized vehicles, in part for speed and in part to gain higher status. These cities will need to develop their own local models, which are only just beginning to crop up in cities like Hangzhou, Buenos Aires, New Delhi, and Taipei. These new models should develop from the local context up. However, if they are to take any leads from European cities, maybe they should look to those with a high modal split, like Denmark and Holland, not a low modal split like France or the UK. In Holland, the OV-Fiets system is hooked into the national train company. Many people live and work in different cities, but when you have a huge number of cyclists, it is hard to fit them all onto the trains. Anyone who has ridden a train in Holland knows that there is virtually no integration for cyclists on the trains. It costs an exorbitant amount, you have to put them into the entryway of the car with no special racks (except on long distance international trains), the elevators are small, and none of this is easy given how heavy Dutch bikes are. The solution, until recently, was to buy two bikes- one for the ‘home’ end and one for the ‘work’ end. You then bike to one station, ride to your destination city, and then pick up your second bike to ride onward. OV-Fiets is integrated with the train operator. You pay only €10 per year in membership and then €3 per ride for up to 24 hours. This seems to be well enjoyed and used by Dutch I have spoken with. Odense in Denmark is trying a similar concept geared toward commuters that is set to launch this spring. This program will cost you about €7 per week, €13 per month, or €33 per year. In the meantime, since October of last year, they have been using a phone based service where you pay about €2,50 per hour as a flat usage fee that comes off your phone bill. JC Decaux, who runs many existing services, will operate it. It’s not clear to me how well used this service is since I haven’t met anyone who has used it yet. 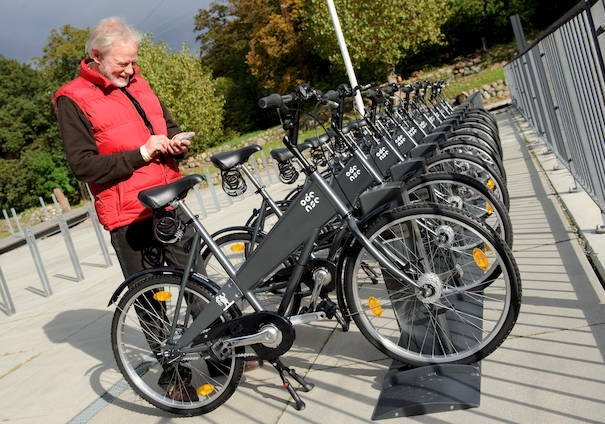 Germany, with about 10% of the population biking, has NextBike and Call-A-Bike which I have written about in an earlier post. These are both floating systems, with no parking stations. Both use cell phones, not smart cards. 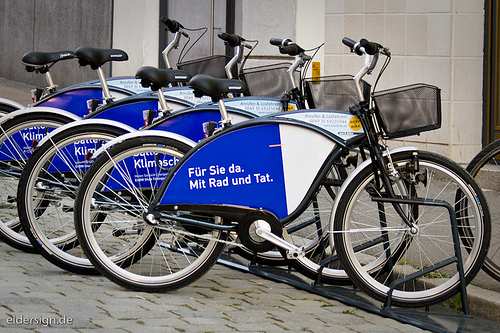 Call-A-Bike is integrated with the DB train system and NextBike is a private operator, whose money comes from advertising and usage fees. NextBike is €1 per hour or €5 per day. Call-A-Bike is €0.08 per minute, €9-12 per day, and €45-60 per week. You can also pay €27-36 per year and then get the first 30 minutes free. NextBike uses extremely cheap bikes with no technology, while Call-A-Bike uses extremely expensive, high-tech bikes. Call-A-Bike bikes have to be placed in certain areas, while NextBike’s can be placed anywhere in the central city. Anecdotal evidence from one user suggests that forcing people to return Call-A-Bike bikes to a certain location is a deterrent, however given the spread of both of these systems throughout a multitude of cities in Germany and abroad, they must be doing something right. These services pricing models are unlike systems like the oft touted London, Paris or Barcelona schemes which typically cost more like 50€ per year where the first 30 minutes is free and then there is a tiered hourly pricing thereafter. These systems for robust cycling communities are also more focused on daily commuters and many use cell phones, not smart cards. The German ones have also experimented with floating models which do not require parking spaces, and may help with the distribution issue. 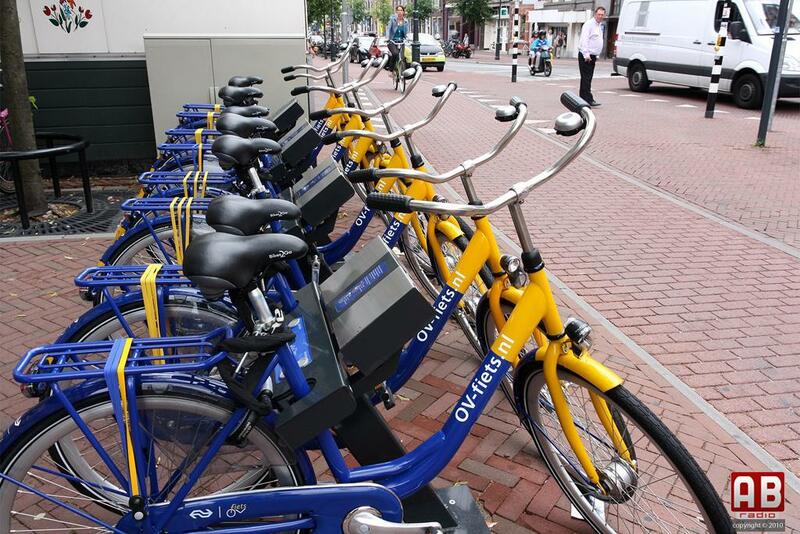 As rapidly developing cities begin to implement bikeshare schemes, we will start to see new paradigms emerging. These contexts are dramatically different in that they consist of large, dense, cities coupled with cheap labor, high theft issues, massive social inequity, completely different cultural norms, and limited technology and data access. These cities have high cycling rates now but they are all dropping due to all manner of motorized alternatives, just as we saw in western cities 50 years ago with the entrance of cars. This context provides its own limitations while also opening up new possibilities and local models will have to be developed. But if there is anywhere to look for inspiration in Europe, it could be from systems where cycling rates are high and municipalities are trying to keep them that way, not cities where rates are low and they are trying to increase them. This entry was posted in Australia, Brazil, Canada, China, Denmark, France, Germany, Holland, India, South Africa, UK, USA and tagged bikeability.dk, bikesharing, multi-modal integration. Bookmark the permalink. Great Idea, our hospital has this option to travel between sites here in Canada instead of driving…. Keep an eye on Nice Ride in Minnesota. It may expand if funding comes through this Spring, which could prove the expansion worldwide is as you predicted. But, public and private money in the US is headlines and policy makers are slashing loads of transportation funding for bikes. Since I’m on the ground in the city I’ll keep you posted on funding outcome in months ahead. Many thanks for the cross post and the engaging and very helpful conversation today. Many thanks for this relevant projection view of the public bikes market outside Europe. To my mind, the emerging bicycle friendly cities shouldn’t be ignored to feed reflexions to increase the cycling use. Even if there are in an other context than the big friendly cycling cities you mentionned, they can be innovated as well. And bike sharing is a particular example. In France, the two main public bicycles services appeared in cities with low cycling modal split: Rennes in 1998 and Lyon in 2005. In fact, they pull up the public bicycles market. If you are interested in further information on public bicycles, I invite you to visit my website where I post several of my bilingual French – English publications : http://www.mobiped.com/accueil_mobiped_en.html. You will find also a publication cowrittent with Pascal Van Der Noort (Vélomondial) about the safety of pedestrians and cyclists worldwide. Benoit Beroud, Mobiped, Paris, France. Thanks for the comment. Of course, I do think that these systems being developed in cities that are trying to create cultures of cycling are relevant and important to draw from for inspiration. I just wanted to highlight that there are different needs (and different strategies required) in societies where you have a lot of cyclists already and the objective is to retain those cyclists by improving their experience. These needs and strategies will likely be different from cities like those in France, Spain, Italy, US, UK, etc. whose aim is more to get new people to consider riding bicycles for the first time. It may be a bit of faulty logic to try to ‘learn from robust cycling cities’ to increase cycling in non-cycling cities just as now it may be faulty logic to try to learn bikesharing from non-cycling cities to apply toward bikesharing in robust cycling cities. What I am suggesting is that perhaps we should be exchanging knowledge between cities that are more similar to each other instead, or that we should at least be mindful of the fact that these are really two separate situations and not everything will translate well. To my mind, the faulty logic is not linked to the size of the city, or the friendly cycling level. Of course, the transferability of experiences is more likely from cities with similar characteristics. But each city can learn small things, ideas or details from any other cities. The faulty logic is to copy paste a cycling policy rather feeding the reflection with external feedbacks to adapt the cycling policy with the local mobility context. I completely agree. Nothing can really be copy/pasted without reflecting on its transferability and a rich understanding of your own local context and the context you are learning from. That reflection and adaptation is the crux of what I find interesting.